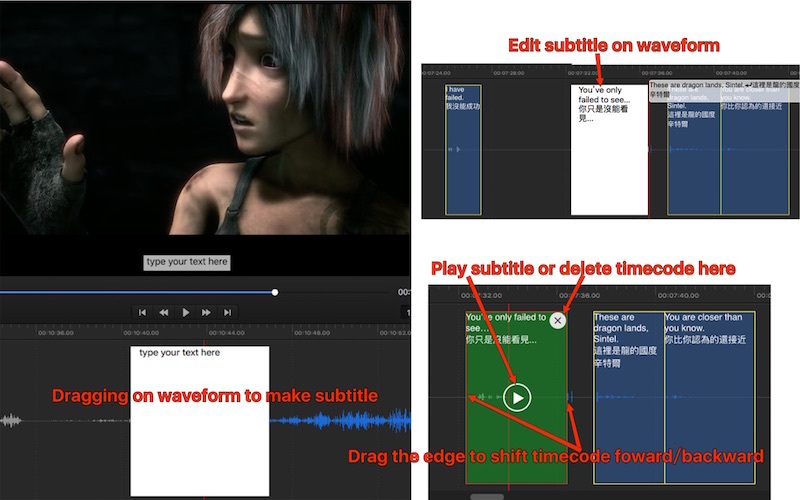 Subtitle Edit Pro is a powerful app to create and edit your subtitles and timecode. We focused on how to make it intuitive and easy to use. Mostly, you just need to drag on the waveform to make timecode, adjust timecode and input text. 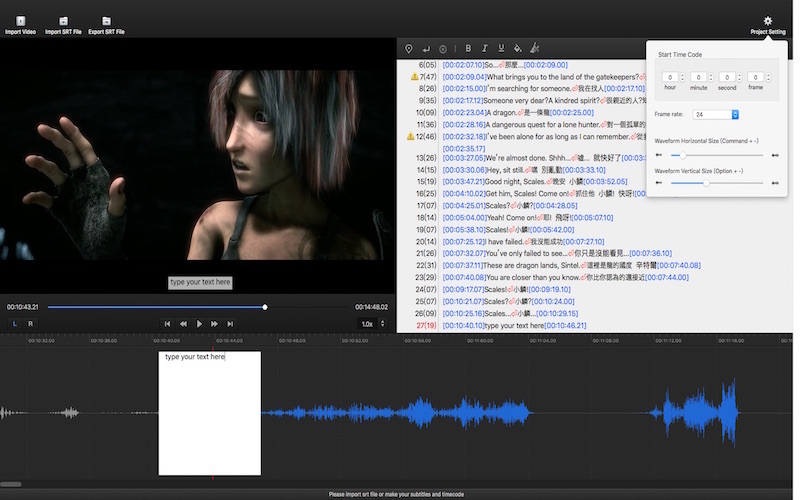 We also offer a text editor to edit subtitles, manipulate timecode. Merge or split subtitle is never been this easy. Please watch the video tutorial before you buy it: http://www.finalsub.com/sep.html. 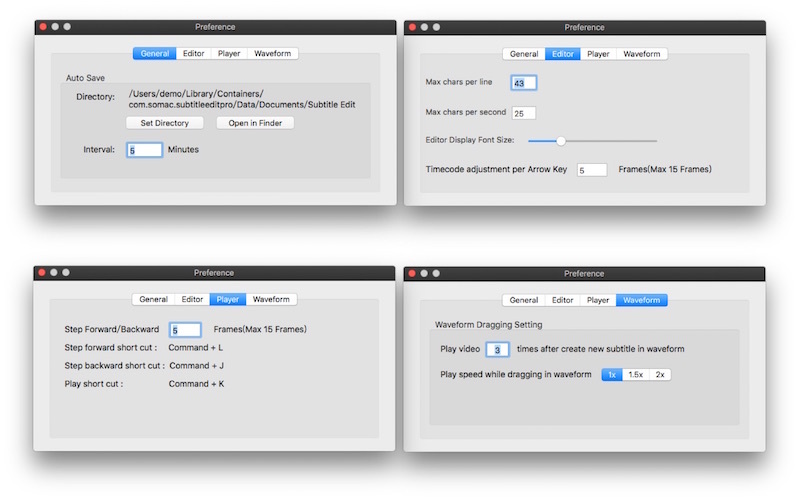 —Waveform Operations: Double click to play, one click to stop. Dragging to make timecode. Drag the edge to adjust timecode. 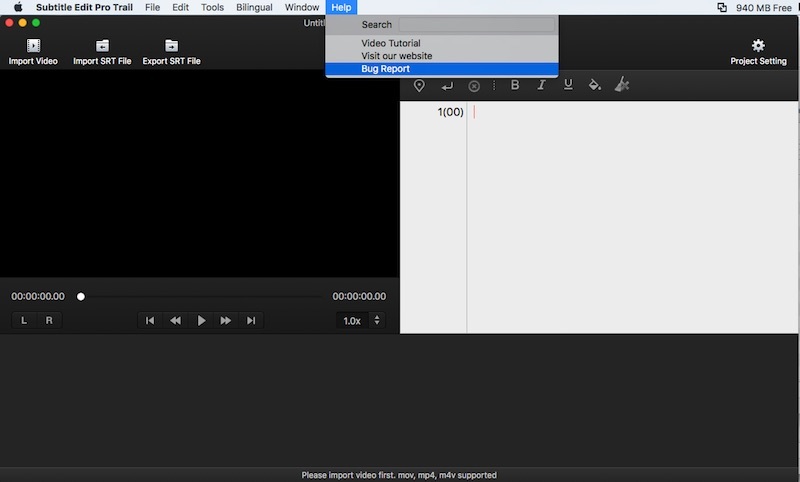 Double click on subtitle to edit text. —Text View Operations: It’s a standard Plain Text Editor. Click timecode to jump. Use arrow key on keyboard to shift timecode forward or backward. —Warning Triangle: Too many letters per line OR Too many letters per second. 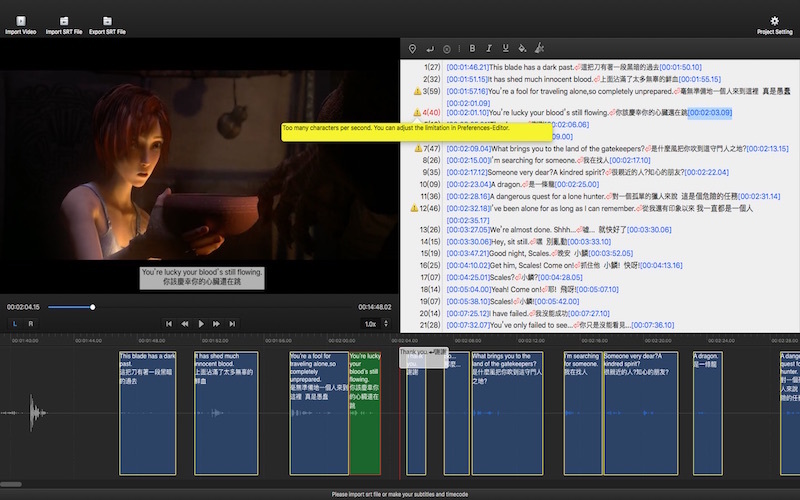 —Delete timecode to merge subtitles and hit return key to split up a subtitle to two subtitles. —Command+JKL to step forward/backward specific frames. —MP4, MOV, M4V without DRM, 3GP and most audio format supported. —Subtitle overlay to the movie for reference. —Support multiple line subtitles.—Basic formatting supported: Italic, Bold, Underline and Font Colour. —Adjust timecode to any HHMMSSFF. —All drag and drop supported. This entry was posted in FinalSub News and tagged Aegisub, app store, edit, editor, jubler, mac, mac os, os x, srt, subs factory, subtitle, subtitle edit, subtitle the editor, subtitle workshop, sync, timecode, timing, waveform. Bookmark the permalink.